How’s this for unexpected? After so many Castlevania games featuring everyone in the universe, Konami has finally decided to return to the storyline begun by John Morris on the Genesis. It’s about time too. If I were a member of the Morris family, I’d be stir crazy from having to wait twelve years for another crack at Dracula. Since the series is no longer exclusively about those bearing the name Belmont, it’s only fitting that Bloodlines gets another shot at stardom. The best thing about this announcement is that it’s for the DS. Yeah, I know we’re still thirsting for that definitive 3D Castlevania, one that combines all the greatness of Symphony of the Night and Rondo of Blood and brings it into the next generation in seamless fashion. Every attempt since the N64 has fallen short of the mark, while the 2D adventures have thrived on Nintendo’s portables. 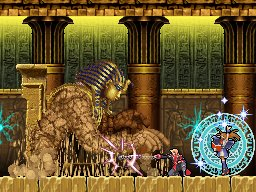 Portrait of Ruin comes hot on the heels of the incredible Dawn of Sorrow, a game many people consider reason enough to own a DS, so there’s a lot to look forward to. But hey, the fact that the star of the only Castlevania game to appear on a Sega console is getting some love is enough to sell me. The plot is straight out of Bloodlines. After World War II, a pair of vampiric sisters attempt to use the souls of the millions of dead in order to revive the Count. Jonathan Morris (son of John, the hero of Bloodlines? ), along with a new hunter named Charlotte Orlean, gears up to stop Dracula’s return. 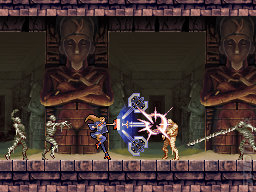 Whereas Morris relies on his trusty whip, Orlean’s talents are magic-based, and players will be able to switch between both characters whenever they want with just the press of a button. The differences in style and abilities between the two are important factors to keep in mind. John is stronger, able to dish out and resist more damage than Charlotte, but she has powerful spells that cost less. Moreover, you can have both heroes onscreen simultaneously, which will come in handy for solving certain puzzles. However, they both share the same energy and magic bars, so it will be vital to know just when both should work together. The second character’s A.I. does little more than attack and follow you, so think twice about rushing headfirst into combat. Konami has yet to finalize whether or not both John and Charlotte will be available for two-player cooperative play, but one can only hope. Being able to tackle this quest with a friend would bring a huge new dimension to this series and make an already attractive title irresistible. Not content to stop at adding a second player, Konami has also made some changes to the gameplay dynamics. For example, you no longer collect souls, as in Dawn of Sorrow. Instead, there’s a new Summons system for unleashing devastating attacks on foes, of which there are over 100. Portrait also returns to the classic concept of earning cash for dispatching Drac’s minions, which can be used for purchasing upgrades and equipment. The fact that Portrait will appear this fall on the DS doesn’t automatically signify that it’s going to be a standard 2D Metroidvania game like the others. Konami is actually beginning to slip in some 3D elements this time around, namely in the backgrounds and some enemies. Everything else — gameplay included — is still firmly entrenched in 2D, so purists can breathe a sigh of relief. That being said, the artwork is still plenty purty. As players make their way through the multiple environments in their quest will find that evil isn’t confined to a just castle anymore. Castlevania guru Koji Igarashi wanted to move the series outside of the standard setting, and those lucky enough to be present at the Konami press conference on Tuesday evening got to see some nice areas. Deserts, towns, and countrysides harkens back to when vampire killers actually got around, like in Simon’s Quest. Even cooler is the concept of a vampire painter whose artwork comes to life, offering stages for the heroic pair to explore. What role he plays in the actual storyline remains to be seen, but I definitely like the idea of entering paintings as levels. 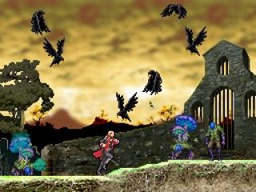 If you’re a Castlevania fan, especially Bloodlines, then this is the DS game for you. Considering the warm response Dawn of Sorrow got last year, I expect this newest installment to be as big a hit. 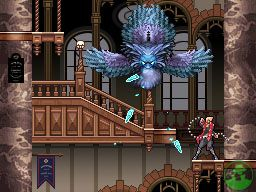 It was odd that Portrait was the only Castlevania game announced at the press conference, so I’m assuming that Iga & company are going to make this one the best it can be. ← E3 2006: Sonic's Rebirth?